In general, we’re huge small-business supporters. 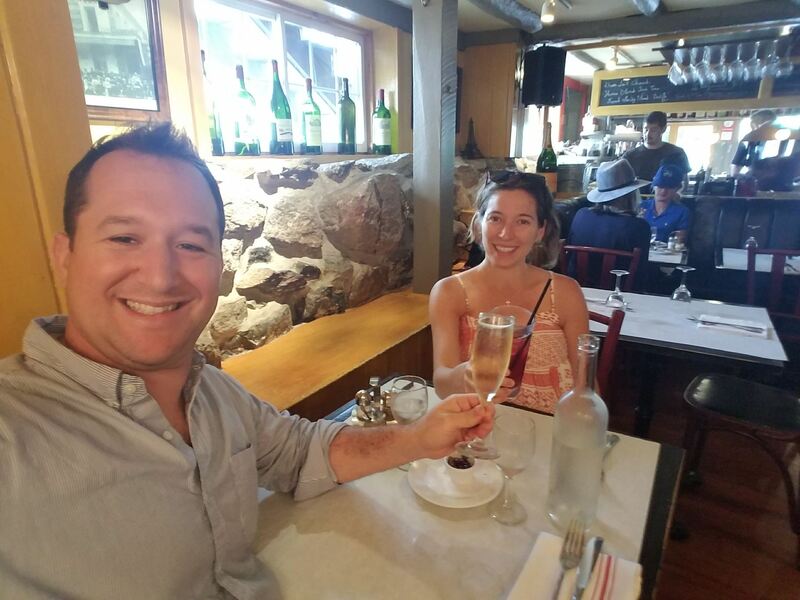 We relished them living in NYC—all those unique spots with that je ne sais quoi ambiance you get when a business is a person, or a family, or a dream. That special sauce you just can’t find in cookie-cutter franchises. And we really enjoy supporting local businesses that support us. Such as Luc’s Cafe, in the heart of Ridgefield, CT. 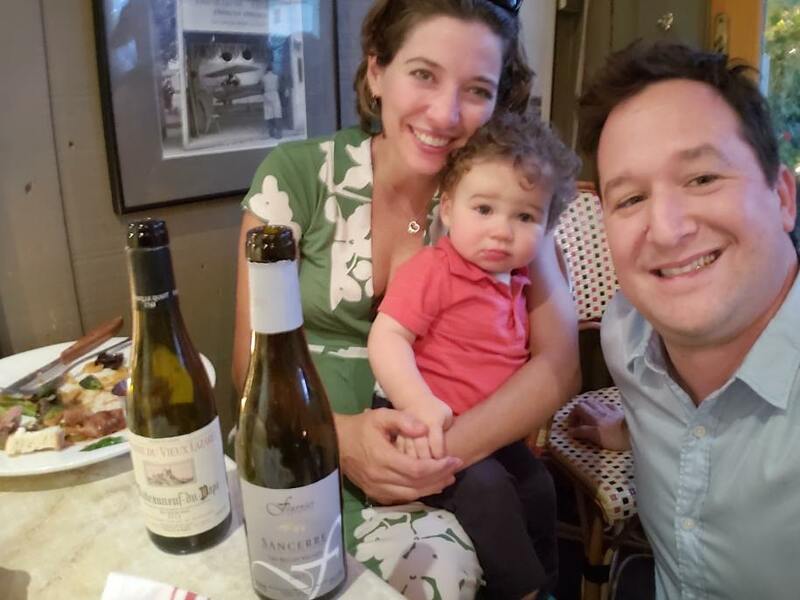 Owner Hervé Aussavis (who grew up in Fontainebleau, outside Paris) opened Luc’s in 2001, when he moved to Ridgefield with his family, after having opened cafés in NYC’s Soho, Greenwich Village and Chelsea. 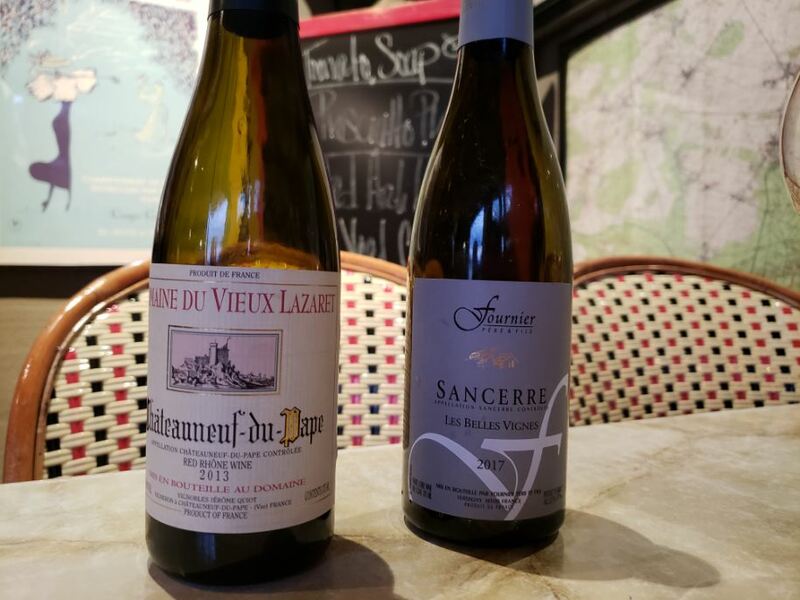 Luc’s always feels like an authentic slice of France, offering up tasty French bistro fare, humming with a buzzy energy that reminds us of the city and, now, serving two of our wines in half-bottle size: Fournier Sancerre Les Belles Vignes and Domaine du Vieux Lazaret Chateauneuf-du-Pape. Just another excellent reason to drop in. With one white and one red, there’s a fine DMS French wine to accompany any entree. And clearly, Hervé has fantastic taste. You’ll recall our Domaine du Vieux Lazaret CDP has gotten a ton of fabulous press lately — 92 Points, Wine Spectator! 92 Points, Wine Enthusiast! 92 Points, Wine & Spirits!, all in their October 2018 issues. And Fournier, well, it’s long been a favorite among friends, and Wine Spectator gave the white 91 Points. It was also a Top 100 in 2016. We recently popped in one Saturday evening with our son, who is always pleasantly captivated by all the energy at Luc’s, meaning Mom and Dad can actually eat. 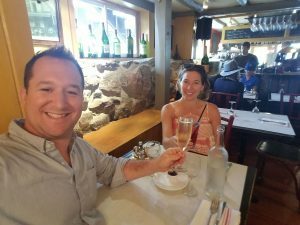 While there, we recalled that Luc’s was actually where we had lunch right after we signed a major stack of papers and closed on our first house. We were pregnant, frozen in shock at all the adulting and hungry. What a moment in time. The savory food distracted us from our daze, and we remember that we were looking forward to getting back as locals. Well, we’ve been back! 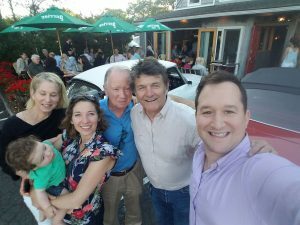 With family, with business colleagues, and it’s always a dependably enjoyable time. 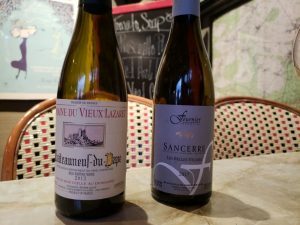 On weekends, it’s always packed, so expect to be lounging at the bar with a glass (or half-bottle 😉 of fine French wine while you wait for a table to open inside or on the patio. As with every time you order wine at a restaurant, always be sure to check the label to ensure you get what you ordered. We’re so happy that a place we’ve enjoyed so much is now serving our wines. It’s taken a while, to be honest, to adjust to life outside the big city, but Ridgefield is starting to feel like home. ← James Suckling Says: 91 Points!